When I saw this news about The Hitman's Bodyguard I had to remind myself that it came out almost a year ago. Thought it was like 3 months ago or something. 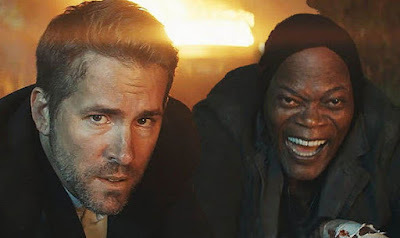 The film wasn't great and obviously wasn't particularly memorable, but it was a lot of fun and had Ryan Reynolds and Samuel L. Jackson mouthing off which is when we like them best. People loved it, and for three weeks in 2017 it was the #1 movie in America, grossing $176M on a $30M budget. That's a long way of saying the sequel has been officially confirmed. THR reports Millennium Films has hit the Cannes market with The Hitman's Wife's Bodyguard, with Ryan Reynolds and Samuel L. Jackson expected to return although they aren't confirmed. Patrick Hughes will be back to direct, though, and considering the title we can probably assume Salma Hayek to be signed at some point. She played the wife of the hitman (Jackson) with Reynolds acting as her bodyguard this time? The film is being marketed with the tagline ”The Good. The Bad. And the Batshit cray" which is totally in keeping with the vulgar language that sold the first movie. Smart move to stick with what works. Millennium is also pushing sequels Rambo 5, Angel Has Fallen, The Expendables 4, and The Mechanic 3, which shows you what their mind set is going forward.